Submitted by witness on Saturday, June 7, 2014. LOCATION DETAILS: As you go down Gratis-Enterprise Road from Gratis heading east you cross the bridge over Twin Creek. There's a pull off on the right where you can park. From there, you can walk down to creek. 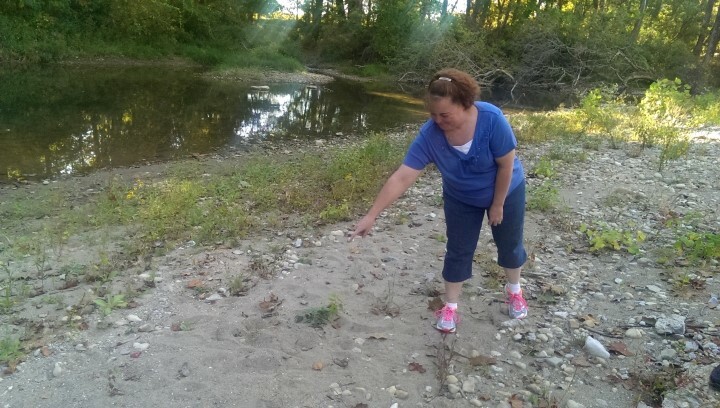 OBSERVED: We went down to the creek (Twin Creek in Preble county) to fish and saw a big footprint in a sandbar that was way too big to be human. We took a picture next to my husband's foot which is a size 13. This was found right where the creek starts to turn to the left on a rocky sandbar that depending on the water level is either exposed or under water. The single track was 15" long x 7" wide x 5" at the heel. ALSO NOTICED: There was an incident in 1978 which is on your website. This sighting is about 1/2 - 1 mile from that one. OTHER WITNESSES: Three of us total. We were just checking out the creek to find an ideal fishing spot when we stumbled upon it. TIME AND CONDITIONS: Around 8 PM at night and clear skies. ENVIRONMENT: By Twin Creek which is a large forested valley on both sides of the creek. It's private property now and I'm not sure who owns it. BFRO Report #4972. This location is an ideal place for any large animals to come and go through this specific part of Ohio. The creek sits in a wooded valley and goes for many miles, ending into the Great Miami River, which eventually flows into the Ohio River. After the seminar, fellow BFRO investigator Jeff Crisman and I followed the witnesses to the location for an onsite investigation. 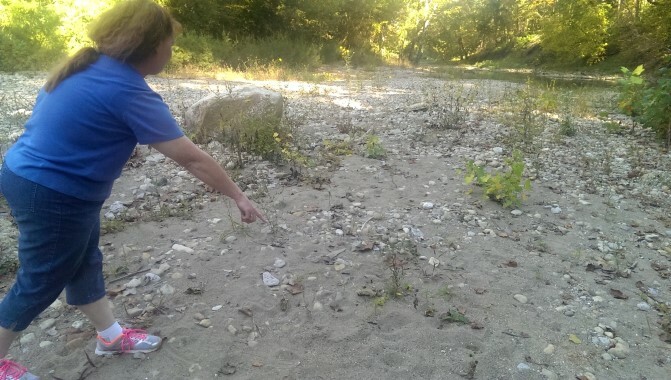 They took us to the exact spot where the track was found heading over a sandbar into the creek. At the time, the water level was way down but there was plenty of evidence of the water level rising and lowering throughout the year. They did note that toes could be seen in the track but sand and debris caused some visual distortion. An abundance of deer tracks were everywhere as well as signs of people fishing in the area. The sides of the valley were quite thick the closer you were to the river leading up to the hillsides of mature hardwood trees. We hiked maybe a half mile down the valley and was quite amazed on how quiet and the remote the area seemed to be. Photos taken at our follow-up interview on location. The witness is pointing where the track was found and which direction it was heading. The rocky substrate really hindered finding any additional tracks. Marc has been a longtime investigator with over 25 years of experience investigating alleged Ohio Bigfoot reports. 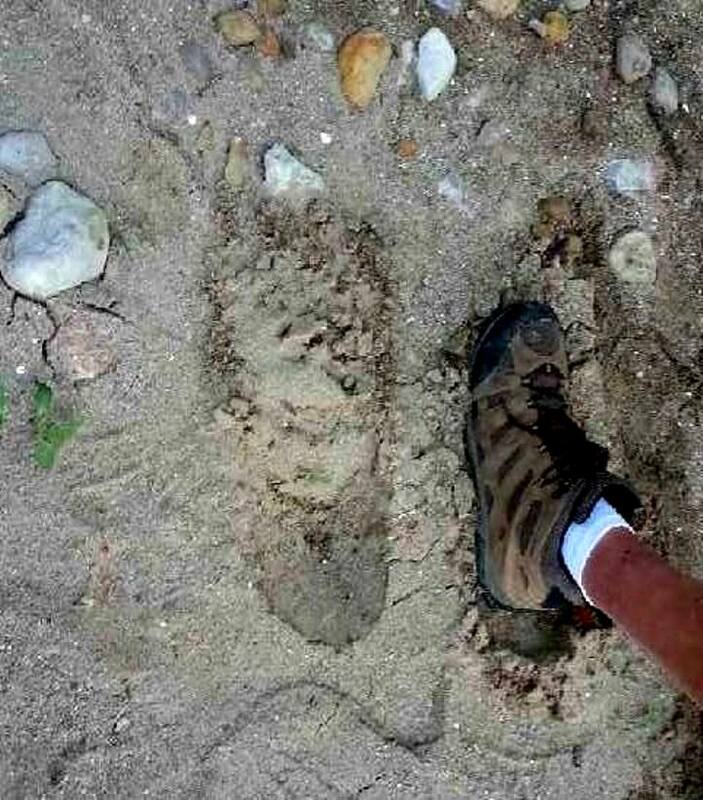 He is currently the organizer of the Ohio Bigfoot Conference that takes place at Salt Fork State Park every year and has featured multiple BFRO Investigators as speakers.